A fully FM approved heat activated ball/butterfly valve fitted with an enclosed compact spring pack mechanical actuator that can sense heat (as well as smoke or a gas leak if fitted with an electrothermal link) and shut off (or open) automatically. Thermal shut-off at your choice of temperatures from 135º to 500ºF (57º to 260ºC) with UL listed enclosed thermal link rugged, reliable, compact, economical and intrinsically safe. These FM approved thermal heat activated (fuseable link) and electrothermal shut-off valve actuators were designed to meet the requirements for plant applications where flammable fluids are piped and controlled such as in the petroleum or process industries. 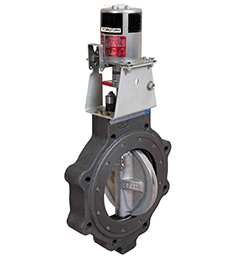 These actuators can be fitted to fireside 2-way and 3-way ball valves up to 100NB (4”) and high performance resilient seated firesafe butterfly valves up to 300NB (12”) in 150 and 300 class. When used in conjunction with firesafe ball valves or high performance butterfly valves the Thermal Actuator has the ability to shut-off in the event of fire or a hazardous situation. An optional electrothermal link is available for connecting with a gas or smoke detector to operate the unit remotely. 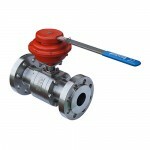 The valve can be set “fail open” for fire protection systems. 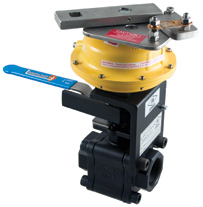 Actuators can be purchased separately or as a complete actuated valve assembly. The electrothermal link will react when subjected to heat or to low-power electrical impulse, such as those found on most smoke or gas detectors. The electro-thermal shut-off valve can be used with smart electrical signaling systems, which are activated, by heat, smoke, gas, flame-energy, maximum temperature or rate of temperature rise. Typical applications include shutting down hazardous lines or activating sprinkler systems for fire control. 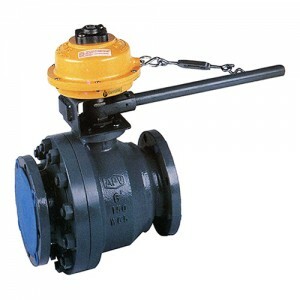 Fuseable link shut down ball valves are available in screwed and flanged ends and can be used as a main line shut down valve, or if fitted to air supply lines to existing spring return pneumatic actuated ESD valves they can shut down air causing main line emergency shut down valves to close before the fire reaches the main line.